Most of you have probably visited Donna's blog, right? If you haven't, go ahead and click on over. I'll wait. I love Donna because of her ah, um, unique and hilarious take on food and her awesome personality, which shines through so brightly in all of her posts. Not to mention the fact that her food always looks so amazing! I've bookmarked about a million recipes from her site to try, and this recipe for Snickers cookies is one of the ones I've been most excited to make. And I have to say, with all honesty, that these are probably the best cookies I have ever made. 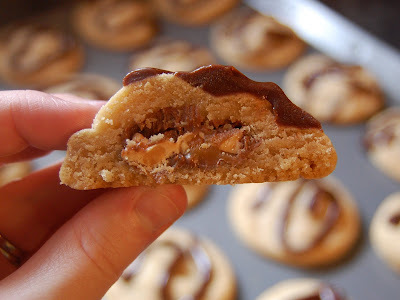 They taste exactly like peanut butter blossoms, but with the added bonus of a chocolatey, peanutty, caramely center. See? Oh. SO GOOD. If loving these cookies is wrong, I never, ever want to be right. What's awesome about these is that the dough requires chilling time, so I was able to start them on Saturday night after Andrew had gone to bed and finish them up the next morning. They were so easy to make and baked up absolutely perfectly. My stepmom, stepsister, and dad all raved about them, not to mention Joe and Andrew, who devoured them with gusto. And now it's Tuesday, and there are only three cookies left. From a batch of 35. And I'm sure they'll be gone by the time I get home tonight. It's dangerous for me to be in possession of this recipe. 1. Combine butter, peanut butter, and sugars using a mixer on medium to low speed until light and fluffy. 2. Slowly add the eggs and vanilla until thoroughly combined. Mix in flour, salt, and baking soda. 3. Cover and chill dough 2 to 3 hours up to a couple of days. 4. Remove dough from fridge. Divide dough into 1 to 2 tablespoon pieces and flatten. 5. Place a Snickers Mini in center of each. Form a ball around the Snickers Mini, taking care to cover it all. 6. Place on cookie sheet and bake at 325 degrees for 10 to 12 minutes. Adjust time as needed if using more than 1 tablespoon dough. (Mine took about 15 minutes.) Let cookies cool 1 to 2 minutes then remove to rack to cool completely. 7. 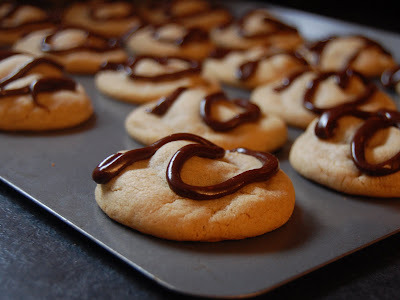 Drizzle melted milk chocolate over each cookie in a zig zag pattern. Cassie, this recipe is printed and I plan to make them for my grandchildren, who are visiting, this weekend. How could they not love them? I do read Donna but some how missed these. They look awesome. Bookmarked! These are officially my husbands favorite cookies. I have made them several times. We are even making them for Santa this year. I followed the directions exactly and the dough came out dry and crumbly. There was no way to flatten the dough out and wrap a snickers in.